on the Internet at: "http://www.fujitsu.com/fts/"
You can find driver updates at: "http://support.ts.fujitsu.com/download"
We hope you enjoy working with your new Fujitsu system! 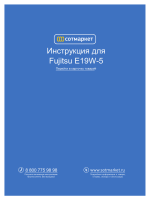 В© Fujitsu Technology Solutions GmbH 2013. All rights reserved. responsibility with regard to technical or editorial mistakes or omissions. Adobe Reader is a trademark of Adobe Systems Incorporated. Sony and Memory Stick are registered trademarks of Sony Electronics, Inc.
& DTS Boost is a trademark of DTS, Inc. Product contains software. В© DTS, Inc. All rights reserved. All other trademarks specified here are the property of their respective owners. the prior written consent of Fujitsu. without the written approval of Fujitsu. Innovative technology . . . . . . . . . . . . . . . . . . . . . . . . . . . . . . . . . . . . . . . . . . . . . . . . . . . . . . . . . . . . . . . . .
Further information . . . . . . . . . . . . . . . . . . . . . . . . . . . . . . . . . . . . . . . . . . . . . . . . . . . . . . . . . . . . . . . . . . . . . .
Notational conventions . . . . . . . . . . . . . . . . . . . . . . . . . . . . . . . . . . . . . . . . . . . . . . . . . . . . . . . . . . . . . . . . . . Ports and controls . . . . . . . . . . . . . . . . . . . . . . . . . . . . . . . . . . . . . . . . . . . . . . . . . . . . . . . . . . . . . . . . . . . . . Important notes . . . . . . . . . . . . . . . . . . . . . . . . . . . . . . . . . . . . . . . . . . . . . . . . . . . . . . . . . . . . . . . . . . . . . . . .
Safety notes . . . . . . . . . . . . . . . . . . . . . . . . . . . . . . . . . . . . . . . . . . . . . . . . . . . . . . . . . . . . . . . . . . . . . . . . . . . .
Additional safety notes for devices with radio components . . . . . . . . . . . . . . . . . . . . . . . . . . . . . . . . . .
Energy saving . . . . . . . . . . . . . . . . . . . . . . . . . . . . . . . . . . . . . . . . . . . . . . . . . . . . . . . . . . . . . . . . . . . . . . . . . .
Energy saving under Windows . . . . . . . . . . . . . . . . . . . . . . . . . . . . . . . . . . . . . . . . . . . . . . . . . . . . . . .
Travelling with your notebook . . . . . . . . . . . . . . . . . . . . . . . . . . . . . . . . . . . . . . . . . . . . . . . . . . . . . . . . . . . .
Before you travel . . . . . . . . . . . . . . . . . . . . . . . . . . . . . . . . . . . . . . . . . . . . . . . . . . . . . . . . . . . . . . . . . . .
Notebook: transporting . . . . . . . . . . . . . . . . . . . . . . . . . . . . . . . . . . . . . . . . . . . . . . . . . . . . . . . . . . . . . . . Cleaning the notebook . . . . . . . . . . . . . . . . . . . . . . . . . . . . . . . . . . . . . . . . . . . . . . . . . . . . . . . . . . . . . . . . . . First-time setup of your device . . . . . . . . . . . . . . . . . . . . . . . . . . . . . . . . . . . . . . . . . . . . . . . . . . . . . . . . .
Unpacking and checking the device . . . . . . . . . . . . . . . . . . . . . . . . . . . . . . . . . . . . . . . . . . . . . . . . . . . . . . Selecting a location . . . . . . . . . . . . . . . . . . . . . . . . . . . . . . . . . . . . . . . . . . . . . . . . . . . . . . . . . . . . . . . . . . . . .
Mains adapter connecting . . . . . . . . . . . . . . . . . . . . . . . . . . . . . . . . . . . . . . . . . . . . . . . . . . . . . . . . . . . . . . . Switching on the device for the first time . . . . . . . . . . . . . . . . . . . . . . . . . . . . . . . . . . . . . . . . . . . . . . . . . . Working with the notebook . . . . . . . . . . . . . . . . . . . . . . . . . . . . . . . . . . . . . . . . . . . . . . . . . . . . . . . . . . . . Status indicators . . . . . . . . . . . . . . . . . . . . . . . . . . . . . . . . . . . . . . . . . . . . . . . . . . . . . . . . . . . . . . . . . . . . . . . . Switching on the notebook . . . . . . . . . . . . . . . . . . . . . . . . . . . . . . . . . . . . . . . . . . . . . . . . . . . . . . . . . . . . . . .
Notebook: switching off . . . . . . . . . . . . . . . . . . . . . . . . . . . . . . . . . . . . . . . . . . . . . . . . . . . . . . . . . . . . . . . . . . Keyboard . . . . . . . . . . . . . . . . . . . . . . . . . . . . . . . . . . . . . . . . . . . . . . . . . . . . . . . . . . . . . . . . . . . . . . . . . . . . . . . Separate number block . . . . . . . . . . . . . . . . . . . . . . . . . . . . . . . . . . . . . . . . . . . . . . . . . . . . . . . . . . . . . .
Key combinations . . . . . . . . . . . . . . . . . . . . . . . . . . . . . . . . . . . . . . . . . . . . . . . . . . . . . . . . . . . . . . . . . . .
Country and keyboard settings . . . . . . . . . . . . . . . . . . . . . . . . . . . . . . . . . . . . . . . . . . . . . . . . . . . . . . .
Touchpad and touchpad buttons . . . . . . . . . . . . . . . . . . . . . . . . . . . . . . . . . . . . . . . . . . . . . . . . . . . . . . . . . .
Moving the pointer . . . . . . . . . . . . . . . . . . . . . . . . . . . . . . . . . . . . . . . . . . . . . . . . . . . . . . . . . . . . . . . . . . Selecting an item . . . . . . . . . . . . . . . . . . . . . . . . . . . . . . . . . . . . . . . . . . . . . . . . . . . . . . . . . . . . . . . . . . . .
Executing commands . . . . . . . . . . . . . . . . . . . . . . . . . . . . . . . . . . . . . . . . . . . . . . . . . . . . . . . . . . . . . . . .
Dragging items . . . . . . . . . . . . . . . . . . . . . . . . . . . . . . . . . . . . . . . . . . . . . . . . . . . . . . . . . . . . . . . . . . . . . . Switching the Touchpad on and off . . . . . . . . . . . . . . . . . . . . . . . . . . . . . . . . . . . . . . . . . . . . . . . . . . . .
Touchscreen/LCD screen without touch function (device-dependent) . . . . . . . . . . . . . . . . . . . . . . . . Using fingers . . . . . . . . . . . . . . . . . . . . . . . . . . . . . . . . . . . . . . . . . . . . . . . . . . . . . . . . . . . . . . . . . . . . . . .
Webcam . . . . . . . . . . . . . . . . . . . . . . . . . . . . . . . . . . . . . . . . . . . . . . . . . . . . . . . . . . . . . . . . . . . . . . . . . . . . . . .
Rechargeable battery . . . . . . . . . . . . . . . . . . . . . . . . . . . . . . . . . . . . . . . . . . . . . . . . . . . . . . . . . . . . . . . . . . . Charging, caring for and maintaining the battery . . . . . . . . . . . . . . . . . . . . . . . . . . . . . . . . . . . . . . . Removing and installing the battery . . . . . . . . . . . . . . . . . . . . . . . . . . . . . . . . . . . . . . . . . . . . . . . . . . .
Optical drive (optional) . . . . . . . . . . . . . . . . . . . . . . . . . . . . . . . . . . . . . . . . . . . . . . . . . . . . . . . . . . . . . . . . . .
Handling data carriers . . . . . . . . . . . . . . . . . . . . . . . . . . . . . . . . . . . . . . . . . . . . . . . . . . . . . . . . . . . . . . .
CD/DVD indicator . . . . . . . . . . . . . . . . . . . . . . . . . . . . . . . . . . . . . . . . . . . . . . . . . . . . . . . . . . . . . . . . . . .
Inserting or removing a data carrier . . . . . . . . . . . . . . . . . . . . . . . . . . . . . . . . . . . . . . . . . . . . . . . . . . .
Manual removal (emergency removal) . . . . . . . . . . . . . . . . . . . . . . . . . . . . . . . . . . . . . . . . . . . . . . . . Using the power-management features . . . . . . . . . . . . . . . . . . . . . . . . . . . . . . . . . . . . . . . . . . . . . . . . . . .
Memory cards . . . . . . . . . . . . . . . . . . . . . . . . . . . . . . . . . . . . . . . . . . . . . . . . . . . . . . . . . . . . . . . . . . . . . . . . . . Supported formats . . . . . . . . . . . . . . . . . . . . . . . . . . . . . . . . . . . . . . . . . . . . . . . . . . . . . . . . . . . . . . . . . .
Inserting the memory card . . . . . . . . . . . . . . . . . . . . . . . . . . . . . . . . . . . . . . . . . . . . . . . . . . . . . . . . . . . Removing the memory card . . . . . . . . . . . . . . . . . . . . . . . . . . . . . . . . . . . . . . . . . . . . . . . . . . . . . . . . . .
Loudspeakers and microphones . . . . . . . . . . . . . . . . . . . . . . . . . . . . . . . . . . . . . . . . . . . . . . . . . . . . . . . . . .
Wireless LAN / Bluetooth . . . . . . . . . . . . . . . . . . . . . . . . . . . . . . . . . . . . . . . . . . . . . . . . . . . . . . . . . . . . . . . . Switching the wireless components on and off . . . . . . . . . . . . . . . . . . . . . . . . . . . . . . . . . . . . . . . . . Setting up WLAN access . . . . . . . . . . . . . . . . . . . . . . . . . . . . . . . . . . . . . . . . . . . . . . . . . . . . . . . . . . . .
Ethernet and LAN . . . . . . . . . . . . . . . . . . . . . . . . . . . . . . . . . . . . . . . . . . . . . . . . . . . . . . . . . . . . . . . . . . . . . . .
Security functions . . . . . . . . . . . . . . . . . . . . . . . . . . . . . . . . . . . . . . . . . . . . . . . . . . . . . . . . . . . . . . . . . . . . . Using the Security Lock . . . . . . . . . . . . . . . . . . . . . . . . . . . . . . . . . . . . . . . . . . . . . . . . . . . . . . . . . . . . . . . . .
Configuring password protection in BIOS Setup Utility . . . . . . . . . . . . . . . . . . . . . . . . . . . . . . . . . . . . . . Protecting BIOS Setup Utility (supervisor and user password) . . . . . . . . . . . . . . . . . . . . . . . . . . . Password protection for booting of the operating system . . . . . . . . . . . . . . . . . . . . . . . . . . . . . . . Password protection for the hard disk . . . . . . . . . . . . . . . . . . . . . . . . . . . . . . . . . . . . . . . . . . . . . . . . . Connecting external devices . . . . . . . . . . . . . . . . . . . . . . . . . . . . . . . . . . . . . . . . . . . . . . . . . . . . . . . . . . . Connecting an external monitor . . . . . . . . . . . . . . . . . . . . . . . . . . . . . . . . . . . . . . . . . . . . . . . . . . . . . . . . . .
HDMI port . . . . . . . . . . . . . . . . . . . . . . . . . . . . . . . . . . . . . . . . . . . . . . . . . . . . . . . . . . . . . . . . . . . . . . . . . . Connecting USB devices . . . . . . . . . . . . . . . . . . . . . . . . . . . . . . . . . . . . . . . . . . . . . . . . . . . . . . . . . . . . . . . .
USB port with charging function (Anytime USB charge) . . . . . . . . . . . . . . . . . . . . . . . . . . . . . . . . .
How to remove USB devices correctly . . . . . . . . . . . . . . . . . . . . . . . . . . . . . . . . . . . . . . . . . . . . . . . . Connecting external audio devices . . . . . . . . . . . . . . . . . . . . . . . . . . . . . . . . . . . . . . . . . . . . . . . . . . . . . . . Microphone port/Line In . . . . . . . . . . . . . . . . . . . . . . . . . . . . . . . . . . . . . . . . . . . . . . . . . . . . . . . . . . . . . .
Headphone port . . . . . . . . . . . . . . . . . . . . . . . . . . . . . . . . . . . . . . . . . . . . . . . . . . . . . . . . . . . . . . . . . . . . . Removing and installing components during servicing . . . . . . . . . . . . . . . . . . . . . . . . . . . . . . . . .
Notes on installing and removing boards and components . . . . . . . . . . . . . . . . . . . . . . . . . . . . . . . . . . Preparing to remove components . . . . . . . . . . . . . . . . . . . . . . . . . . . . . . . . . . . . . . . . . . . . . . . . . . . . . . . . Installing and removing memory expansion . . . . . . . . . . . . . . . . . . . . . . . . . . . . . . . . . . . . . . . . . . . . . . . . Removing the cover . . . . . . . . . . . . . . . . . . . . . . . . . . . . . . . . . . . . . . . . . . . . . . . . . . . . . . . . . . . . . . . . . Removing memory modules . . . . . . . . . . . . . . . . . . . . . . . . . . . . . . . . . . . . . . . . . . . . . . . . . . . . . . . . . . Installing a memory module . . . . . . . . . . . . . . . . . . . . . . . . . . . . . . . . . . . . . . . . . . . . . . . . . . . . . . . . . . Securing the cover . . . . . . . . . . . . . . . . . . . . . . . . . . . . . . . . . . . . . . . . . . . . . . . . . . . . . . . . . . . . . . . . . . Removing and installing the hard disk . . . . . . . . . . . . . . . . . . . . . . . . . . . . . . . . . . . . . . . . . . . . . . . . . . . . Removing a cover . . . . . . . . . . . . . . . . . . . . . . . . . . . . . . . . . . . . . . . . . . . . . . . . . . . . . . . . . . . . . . . . . . . Removing a hard disk . . . . . . . . . . . . . . . . . . . . . . . . . . . . . . . . . . . . . . . . . . . . . . . . . . . . . . . . . . . . . . . Installing a hard disk . . . . . . . . . . . . . . . . . . . . . . . . . . . . . . . . . . . . . . . . . . . . . . . . . . . . . . . . . . . . . . . . .
Attaching the cover . . . . . . . . . . . . . . . . . . . . . . . . . . . . . . . . . . . . . . . . . . . . . . . . . . . . . . . . . . . . . . . . . .
Finishing component removal . . . . . . . . . . . . . . . . . . . . . . . . . . . . . . . . . . . . . . . . . . . . . . . . . . . . . . . . . . . . Settings in BIOS Setup Utility . . . . . . . . . . . . . . . . . . . . . . . . . . . . . . . . . . . . . . . . . . . . . . . . . . . . . . . . . . Starting the BIOS Setup Utility . . . . . . . . . . . . . . . . . . . . . . . . . . . . . . . . . . . . . . . . . . . . . . . . . . . . . . . . . . .
Operating BIOS Setup Utility . . . . . . . . . . . . . . . . . . . . . . . . . . . . . . . . . . . . . . . . . . . . . . . . . . . . . . . . . . . . . Exiting BIOS Setup Utility . . . . . . . . . . . . . . . . . . . . . . . . . . . . . . . . . . . . . . . . . . . . . . . . . . . . . . . . . . . . . . . .
Exit Saving Changes - save changes and exit BIOS Setup Utility . . . . . . . . . . . . . . . . . . . . . . .
Exit Discarding Changes вЂ“ Discard changes and exit BIOS Setup Utility . . . . . . . . . . . . . . . . .
Load Setup Defaults вЂ“ Copy Standard Entries . . . . . . . . . . . . . . . . . . . . . . . . . . . . . . . . . . . . . . . . . Discard Changes вЂ“ Discard changes without exiting the BIOS Setup Utility . . . . . . . . . . . . . . .
Save Changes - save changes without exiting the BIOS Setup Utility . . . . . . . . . . . . . . . . . . . .
Save Changes and Power Off . . . . . . . . . . . . . . . . . . . . . . . . . . . . . . . . . . . . . . . . . . . . . . . . . . . . . . .
Troubleshooting and tips . . . . . . . . . . . . . . . . . . . . . . . . . . . . . . . . . . . . . . . . . . . . . . . . . . . . . . . . . . . . . .
Help if problems occur . . . . . . . . . . . . . . . . . . . . . . . . . . . . . . . . . . . . . . . . . . . . . . . . . . . . . . . . . . . . . . . . . . . Restoring the hard disk contents under Windows . . . . . . . . . . . . . . . . . . . . . . . . . . . . . . . . . . . . . . . . . . The notebookвЂ™s date or time is incorrect . . . . . . . . . . . . . . . . . . . . . . . . . . . . . . . . . . . . . . . . . . . . . . . . . . . The notebookвЂ™s LCD screen remains blank . . . . . . . . . . . . . . . . . . . . . . . . . . . . . . . . . . . . . . . . . . . . . . . . The LCD screen is difficult to read . . . . . . . . . . . . . . . . . . . . . . . . . . . . . . . . . . . . . . . . . . . . . . . . . . . . . . . . The external monitor remains blank . . . . . . . . . . . . . . . . . . . . . . . . . . . . . . . . . . . . . . . . . . . . . . . . . . . . . . The external monitor is blank or the image is unstable . . . . . . . . . . . . . . . . . . . . . . . . . . . . . . . . . . . . . The notebook cannot be started . . . . . . . . . . . . . . . . . . . . . . . . . . . . . . . . . . . . . . . . . . . . . . . . . . . . . . . . . . The notebook stops working . . . . . . . . . . . . . . . . . . . . . . . . . . . . . . . . . . . . . . . . . . . . . . . . . . . . . . . . . . . . . The printer does not print . . . . . . . . . . . . . . . . . . . . . . . . . . . . . . . . . . . . . . . . . . . . . . . . . . . . . . . . . . . . . . . . The radio connection to a network does not work . . . . . . . . . . . . . . . . . . . . . . . . . . . . . . . . . . . . . . . . . .
Acoustic warnings . . . . . . . . . . . . . . . . . . . . . . . . . . . . . . . . . . . . . . . . . . . . . . . . . . . . . . . . . . . . . . . . . . . . . . .
Error messages on the screen . . . . . . . . . . . . . . . . . . . . . . . . . . . . . . . . . . . . . . . . . . . . . . . . . . . . . . . . . . .
Technical data . . . . . . . . . . . . . . . . . . . . . . . . . . . . . . . . . . . . . . . . . . . . . . . . . . . . . . . . . . . . . . . . . . . . . . . . .
LIFEBOOK . . . . . . . . . . . . . . . . . . . . . . . . . . . . . . . . . . . . . . . . . . . . . . . . . . . . . . . . . . . . . . . . . . . . . . . . . . . . .
Mains adapter (90W) . . . . . . . . . . . . . . . . . . . . . . . . . . . . . . . . . . . . . . . . . . . . . . . . . . . . . . . . . . . . . . . . . . . .
Power adapter, 65 W . . . . . . . . . . . . . . . . . . . . . . . . . . . . . . . . . . . . . . . . . . . . . . . . . . . . . . . . . . . . . . . . . . . .
ManufacturerвЂ™s notes . . . . . . . . . . . . . . . . . . . . . . . . . . . . . . . . . . . . . . . . . . . . . . . . . . . . . . . . . . . . . . . . . . Disposal and recycling . . . . . . . . . . . . . . . . . . . . . . . . . . . . . . . . . . . . . . . . . . . . . . . . . . . . . . . . . . . . . . . . . . Declarations of Conformity . . . . . . . . . . . . . . . . . . . . . . . . . . . . . . . . . . . . . . . . . . . . . . . . . . . . . . . . . . . . . . .
CE marking . . . . . . . . . . . . . . . . . . . . . . . . . . . . . . . . . . . . . . . . . . . . . . . . . . . . . . . . . . . . . . . . . . . . . . . . . . . .
Regulatory notices . . . . . . . . . . . . . . . . . . . . . . . . . . . . . . . . . . . . . . . . . . . . . . . . . . . . . . . . . . . . . . . . . . . . . .
Regulatory information for notebooks without radio device . . . . . . . . . . . . . . . . . . . . . . . . . . . . . .
DOC (Industry CANADA) notices . 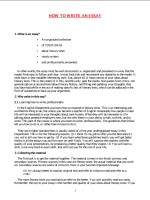 . . . . . . . . . . . . . . . . . . . . . . . . . . . . . . . . . . . . . . . . . . . . . . . . . . . .
FCC regulatory information for notebooks with radio device . . . . . . . . . . . . . . . . . . . . . . . . . . . . .
Index . . . . . . . . . . . . . . . . . . . . . . . . . . . . . . . . . . . . . . . . . . . . . . . . . . . . . . . . . . . . . . . . . . . . . . . . . . . . . . . . . .
... and ergonomic design make your device a reliable and convenient companion. long operating time because of its high capacity battery. protect your system against unauthorised access by using the powerful password properties. can be found in "Ports and controls", Page 9. The Windows drivers for your device can be found on our Internet site. if any other operating system is used. if they come within the scope of the delivery. defective through failure to observe these warnings. Indicates important information for the proper use of the device. вЂў names of programs or files, e.g. Windows or setup.exe. cross-references to another section, e.g. "Safety information"
these components before you start to work with the device. the opening for the emergency eject are still present, but have no function. which will help you with your notebook. as well as the safety notes given below. with the symbol on the left. notes in this operating manual. notebook for use and switching it on for the first time. section "Cleaning the notebook", Page 15.
provided in the "Safety/Regulations" manual. components during servicing", Page 49.
please contact your sales outlet or our Hotline/Service Desk. Switch off the radio components when you are in an aircraft or driving in a car. electronics system. The transmitted radio waves can impair the operation of medical devices. transmitted radio waves can cause an explosion or a fire. "Switching the wireless components on and off", Page 38.
are not using them. If you use the energy saving functions, the notebook uses less energy. You will then be able to work for longer before having to recharge the battery. Energy efficiency is increased and the environmental impact is reduced. You save money while protecting the environment. Please observe the points listed below when travelling with your notebook. в–є Back up important data stored on your hard disk. connection, it is also possible for unauthorised third parties to receive data. attendants if it is OK to do so. your notebook. Do not use any other voltage converter! not the case, buy a power cable that matches the local conditions. 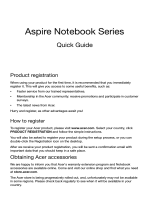 your notebook there (see also "CE marking", Page 68). (e.g. direct sunlight in a car). If your device has an optical drive, remove all data media (e.g. CD, DVD) from the drives. Unplug the mains adapter and all external devices from the power socket. Disconnect the mains adapter cable and the data cables for all external devices. case to transport your notebook. Do not clean any interior parts yourself; leave this job to a service technician. device, the paintwork or the notebook itself. Ensure that no liquid enters the notebook. surface with a very soft, slightly damp cloth. в–є Switch the notebook off. adaptor and remove the battery (see "Removing and installing the battery", Page 31). been moistened in mild domestic detergent and then carefully wrung out. To clean the keyboard and the touchpad, if available, you can use disinfectant wipes. Ensure that no liquid enters the device. 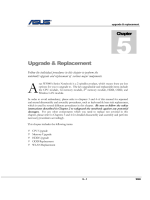 Please read the chapter "Important notes", Page 13.
hardware drivers and supplied software are already pre-installed. adapter must be connected during the entire installation process. can appear. The display may remain dark for a short time or may flicker. Please follow the instructions on the screen. NEVER switch off your device during the first-time setup process. On delivery, the battery can be found in the battery compartment or in the accessories kit. The battery must be charged if you want to operate your device using the battery. can increase the operating time by using the available energy-saving functions. device, please refer to the operating manual for your device. notify your local sales outlet immediately! в–є Unpack all the individual parts. в–є Check your device for any visible damage which may have occurred during transportation. You may need the packaging in the future, if you need to transport your device. Never place the device or the mains adapter on a heat-sensitive surface. The surface could be damaged as a result. bed). This can block the air vents and cause overheating and damage. with the skin may become unpleasant or even result in burns. rubber feet of the device may mark certain types of delicate surfaces. mains adapter to ensure adequate ventilation. Never cover the ventilation slots of the device. the device from dust, humidity, and heat. Observe the safety notes in the enclosed "Safety/Regulations" manual. protective earth and metallic housing parts causes a very weak electrical current. This effect is harmless. The device meets all relevant safety standards. for use in the country in which you intend to use it. в–є Plug the mains cable (2) into a mains outlet. the DC jack (DC IN) of the device. the device to the mains using the mains adapter. you are requested to do so! is pre-installed on the hard disk. в–є Switch on your device. в–є During installation, follow the instructions on screen. information on the system and drivers, help programmes, updates, manuals etc. on the device or on the Internet at "http://www.fujitsu.com/fts/support/". on the Internet at "http://windows.microsoft.com". devices such as a mouse and a printer to the notebook. Please refer to the notes in "Important notes", Page 13.
the drives and the keyboard functions. вЂў The indicator is lit: The wireless components are switched on. вЂў The indicator is not lit: The wireless components are switched off. вЂў The indicator is lit: The notebook is switched on. вЂў The indicator flashes: The notebook is in standby mode. вЂў The indicator is not lit: The notebook is switched off. The state of charge of the battery is shown by the battery indicator. вЂў Indicator is off: The system is in battery operation. The indicator is illuminated (orange): The battery is charging. Indicator is blue: The battery is fully charged. Indicator is off: There is no battery installed. в–є Open the LCD screen. second to switch the notebook on. The power-on indicator is lit. device. Otherwise data might be lost. в–є Shut down the operating system correctly. в–є Close the LCD screen. liable to wear away over the life of the notebook. The keyboard has been designed to provide all the functions of an enhanced keyboard. Some enhanced keyboard functions are mapped with key combinations. 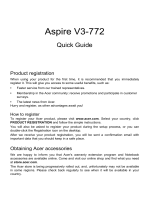 are described in the relevant manuals supplied with your application programs. The figure below shows how to access the different characters on keys with overlaid functions. The example applies when the Caps Lock key has not been activated. The illustrations shown below may differ from your actual device. The Backspace key deletes the character to the left of the cursor. The Tab key moves the cursor to the next tab stop. is executed when you press this key. The Menu key opens the menu for the active application. The keyboard of your notebook has a separate number block on the far right. following key combinations may not function in other operating systems or with certain device drivers. в–є Press the first key in the combination and keep it pressed. в–є While holding the first key down, press the other key or keys in the combination. This key combination switches the wireless components off or on. This key combination decreases the brightness of the screen. This key combination increases the brightness of the screen. display if an external monitor is connected. high refresh rate on an external monitor. webcam has been enabled in the BIOS Setup utility. Keep the touchpad clean. Protect it from dirt, liquids and grease. Do not use the touchpad if your fingers are dirty. Do not rest heavy objects (e.g. books) on the touchpad or the touchpad buttons. The touchpad enables you to move the mouse pointer on the screen. to the buttons on a conventional mouse. the pointer on the screen (see also "Key combinations", Page 24). в–є Move your finger on the touchpad. в–є Move the pointer to the item you wish to select. в–є Tap the touchpad once or press the left button once. в–є Move the pointer to the field you wish to select. в–є Tap the touchpad twice or press the left button twice. в–є Select the desired item. with the finger on the touchpad. The item will be moved. see "Key combinations", Page 24.
monitor resolution which differs from the specification can result in an unclear picture. The screen resolution of the LCD monitor of your notebook is optimally set at the factory. faulty pixels is specified in the international standard ISO 9241-307 (Class II). or an equivalent mix (1 light subpixel counts as 2 dark subpixels) are allowed to be defective. by complete functionality of the display. within a pixel that enhances the pixel function. subpixels in a 5 x 5 pixel block. set the brightness of your monitor individually. under "Display output, switch between". select this option or to activate it. there longer until the action is taken. the home page in this way. web page, map or another screen. double-tap will make it smaller again. в–є Tap on the input field. record video clips or take part in web chats. The picture quality depends on the lighting conditions and the software being used. program or a video conferencing program which supports a webcam). When using the webcam the notebook support must not wobble. the LCD screen may flicker while the light level is adjusted. of the program which uses the webcam. battery life is around 500 charge/discharge cycles. You can extend the battery life by taking advantage of the available energy saving functions. is between 5В°C and max. 35В°C. (see "Mains adapter connecting", Page 17). within five minutes of the warning alarm described above, your notebook will automatically switch off. you place the mouse pointer on the battery symbol, the system displays the battery status. the batteries are stored, the lower the rate of self-discharge. of charge of the battery at regular intervals. should be completely discharged and then fully recharged. notebook. Never store the batteries in the device. batteries from the device so that their state of charge is maintained. Never use force when fitting or removing a battery. Make sure that no foreign bodies get into the battery connections. can make it impossible to recharge. в–є Prepare for removal, see chapter "Preparing to remove components", Page 50.
в–є Slide the release button in the direction of the arrow (1) and hold it in place. в–є Slide the release button in direction of the arrow (2). в–є Remove the battery from the battery compartment (3). Position the battery at the edge. Insert the battery into the battery compartment until it engages positively (1). Slide the release button in the direction of the arrow (2). Slide the release button in the direction of the arrow (3). Complete the removal, see chapter "Finishing component removal", Page 56. 1:2007: LASER CLASS 1, and must therefore not be opened. Avoid touching the surface of a data carrier. Only handle data carriers by their edges. being covered in dust, scratched or damaged in any other way. вЂў Protect your data carriers against dust, mechanical vibrations and direct sunlight. вЂў Avoid storing a data carrier in areas subject to high temperatures or humidity. You may use both 8-cm and 12-cm data carriers in the optical drive. When using a data carrier of lesser quality, vibrations and reading errors may occur. the drive is ready for reading. The indicator lights up when the drive is being accessed. You may only remove the data carrier when the indicator is unlit. instead continues to flash, this means that the drive cannot access the data carrier. carrier that the drive cannot read. The notebook must be switched on. в–є Push the insert/eject button (1). The drive tray will open. в–є Gently pull the drive tray (2) completely out. the printed side facing upwards. feel it lock into place. In the event of a power failure or damage to the drive, you can remove the data carrier manually. в–є Switch your notebook off. paperclip) firmly into the opening (1). the drive tray (2) out of the drive. will then be able to work longer when using the battery before having to recharge it. at the same time help protect the environment. notebook automatically enters a power saving mode. в–є Select the power management functions in your Control Panel. в–є Select the Screen Saver in your Control Panel. settings by pressing F1 to open the Microsoft Help. or in a swap file on the hard disk. nearly empty, close the open files and do not go into power saving mode. в–є Close all opened programs and completely shut down the notebook. Your notebook is equipped with an integrated memory card reader. Observe the manufacturerвЂ™s instructions when handling the memory cards. delicate contact surfaces could be damaged. card (see the documentation for your operating system). в–є Pull the memory card out of the slot. found in "Ports and controls", Page 9.
and also enabling/disabling the loudspeakers using key combinations. If you attach an external microphone, the built-in microphone is disabled. When you connect headphones or external speakers, the built-in speakers are disabled. in "Connecting external devices", Page 44.
will invalidate the certifications issued for this device. в–є Press the key combination Fn + F5 to start the WirelessSelector. be switched off when you switch off the radio components. components provided in the "Safety" manual. included in the Wireless LAN software. documentation for your operating system. establish a connection to a local network (LAN = Local Area Network). port of the notebook (1). Your network administrator can help you to configure and use the LAN connections. cable can be obtained from a specialist dealer. This chapter explains how to use each function, and what the benefits are. drives, CDs, DVDs or Blu-ray Discs. of the passwords and keep them in a safe place. and a charge will be made for assistance. from theft. The Kensington Lock Cable is available as an accessory. Fujitsu Technology Solutions recommends the use of a combination lock. not covered by your warranty and a charge will be made for assistance. Your password can be up to eight characters long and contain letters and numbers. No distinction is made between uppercase and lowercase. the screen while you are setting up the password. the BIOS-Setup-Utility, while the user password will only give you access to some of the functions. You can only set up a user password if a supervisor password has already been assigned. of how to call up and operate the BIOS-Setup-Utility. в–є Start the BIOS Setup Utility and go to the Security menu. в–є Select the Set Supervisor Password field and press the Enter key. With Enter new Password: you are asked to enter a password. в–є Enter the password and press the Enter key. Confirm new Password requires you to confirm the password. в–є Enter the password again and press the Enter key. Changes have been saved is a confirmation that the new password has been saved. when configuring the supervisor password. If you do not want to change any other settings, you can exit BIOS Setup Utility. в–є In the Exit menu, select the option Save Changes & Exit. в–є Select Yes and press the Enter key. necessary to first enter your supervisor or user password in order to open the BIOS Setup Utility. Please note that the user password only provides access to a few of the BIOS settings. BIOS Setup Utility with the supervisor password. в–є Call the BIOS Setup Utility and go to the Security menu. в–є When changing the password, proceed exactly as for password assignment. в–є Highlight the Set Supervisor Password or Set User Password field and press the Enter key. You will be requested to enter the current password by the Enter Current Password prompt. You will be requested to enter a new password by the Enter New Password prompt. в–є Press the Enter key twice. The notebook will now reboot with the password removed. Removing the supervisor password simultaneously deactivates the user password. prevent booting of the operating system. Start the BIOS Setup Utility and go to the Security menu. Select the Password on Boot option and press the Enter key. Select the Save Changes & Exit option under Exit. The notebook will reboot. You will be prompted to enter your password (the supervisor password). в–є Select the Password on Boot option and press the Enter key. в–є Select the Disabled option and press the Enter key. в–є Select the Save Changes & Exit option under Exit. The notebook will reboot. The system is no longer password-protected. is that you have assigned at least the supervisor password. в–є Call up the BIOS Setup and select the Security menu. password now, if desired (see "Security functions", Page 40). в–є Mark the Hard Disk Security field and press the Enter key. в–є In the Drive0 area mark the Set Master Password field and press the Enter key. Enter new Password then appears and you are asked to enter a password. new password has been saved. setting up the password for the first hard disk (Drive0). Setup once you have finished changing the settings. в–є From the Exit menu, choose the option Exit Saving Changes. в–є Press the Enter key and select Yes. will ask you to enter the password when the notebook is restarted again. You will be initially requested to enter the old password by the Enter current Password prompt. You will then be requested to enter a new password by the Enter new Password prompt. в–є After entering the password, press the Enter key three times. The notebook reboots, and password protection for the hard disk is cancelled. for cancelling the password for the first hard disk (Drive0). connecting or disconnecting any devices to or from your notebook. Always read the documentation supplied with the device you wish to connect. Never connect or disconnect cables during a thunderstorm. Never pull at a cable when disconnecting it. Always grasp the plug. to the documentation supplied with the external device. system and external device documentation). Turn off your notebook and all external devices. Unplug your notebook and all devices from the mains sockets. Connect the cables for your external devices following the instructions. Plug all power cables into the mains sockets. 1. Turn off your notebook and all external devices. 2. Unplug your notebook and all devices from the mains sockets. 3. Disconnect the cables for your external devices following the instructions. "Key combinations", Page 24, section "Toggle output screen"). в–є Switch off the notebook and the external monitor. в–є Connect the data cable of the external monitor to the monitor port of the notebook. в–є First switch on the external monitor and then the notebook. monitor and the notebookвЂ™s LCD screen, see chapter "Key combinations", Page 24. LCD TV or a plasma TV with an HDMI connection. (e.g. a DVD drive, a printer, a scanner or a modem). devices while your operating system is running. USB 1.x has a maximum data transfer rate of 12 Mbit/s. USB 2.0 has a data transfer rate of up to 480 Mbit/s. USB 3.0 has a data transfer rate of up to 5 Gbit/s. Additional information can be found in the documentation for the USB devices. USB devices will be automatically recognised and installed by your operating system. the battery more quickly if an external USB device is being charged. the connected USB devices will not be charged. notebook is switched off, as no drivers are active when the notebook is switched off. or a mobile phone or to connect a USB lamp), even if the notebook is switched off. to ensure that none of your data is lost. в–є Left click on the icon to safely remove hardware, located in the taskbar. в–є Select the device which you want to shut down and remove. в–є Press the Enter key. Wait for the dialogue box which tells you that it is now safe to remove the device. player, MP3 player, CD player or a tape deck to your notebook. port/Line In of the notebook. You can connect headphones or external loudspeakers to your notebook via the headphone port. The internal loudspeakers are disabled. The headphone port on your notebook is a "3.5 mm jack socket". If you want to connect headphones or a speaker you will need a "3.5 mm jack plug". fire risk) and will invalidate your warranty. components described in this chapter yourself. Desk, then the warranty of your notebook will be voided. Switch the notebook off and pull the power plug out of the mains socket. Take care when you use the locking mechanisms on the battery and any other component. Never use sharp objects such as screwdrivers, scissors or knives as leverage to remove covers. The equipment and tools you use must be free of static charges. Always hold boards with ESDs by their edges. Never touch pins or conductors on boards fitted with ESDs. Please observe the safety information in chapter "Important notes", Page 13. Remove the power plug from the mains outlet ! в–є Switch the device off. The device must not be in energy-saving mode ! в–є Remove all the cables from the device. anti-slip cloth on this surface to prevent the device from being scratched. в–є Remove the battery (see "Removing the battery", Page 32). see "Preparing to remove components", Page 50.
notebook (see "Technical data", Page 66). Never use force when installing or removing a memory extension. Make sure that foreign objects do not fall into the memory extension compartment. or installing memory modules. Otherwise, there is a risk of suffering burns! note of chapter "Notes on installing and removing boards and components", Page 49.
в–є Remove the screw (1). в–є Lift the cover off the notebook (2). The memory module snaps upwards (2). in the direction of the arrow (3). and the recess (a) facing the slot (1). в–є Place the cover into its installation position in the direction of the arrow (1). в–є Secure the cover using the screw (2). в–є Remove the battery (see Chapter "Removing the battery", Page 32). в–є Remove the screws (1). other. If you install the wrong screws, components may be damaged. the correct screws must be used. of the arrow (1) using the pull-out aid. в–є Remove the hard disk from the hard disk compartment (2). correct screws. If you install the wrong screws, components may be damaged. в–є Place the hard disk into the hard disk compartment (1). в–є Use the pull-out aid to slide the hard disk in the direction of the arrow (2) until it is heard to engage. в–є Place the cover in the correct mounting position (1). the keyboard is firmly seated. Make sure that you use the correct screws, they have different lengths. в–є Tighten the screws (2). в–є Insert the battery (see Chapter "Inserting battery", Page 33). в–є Install the battery again (see "Inserting battery", Page 33). в–є Turn the notebook the right way up again and place it on a flat surface. в–є Reconnect the cables that you disconnected before. soon as you save and exit the BIOS Setup Utility. в–є Reboot the device (switch off/on or reboot the operating system). в–є Press the function key F2 . в–є If a password has been assigned, enter the password and press the Enter key. or contact our customer service centre. The BIOS Setup Utility starts. of the individual settings is shown in the right-hand window of the BIOS Setup Utility. With the F9 key you can load the default settings of the BIOS Setup Utility. в–є Use the cursor keys в†ђ or в†’ to select the menu you wish to access to make changes. The menu is displayed on the screen. в–є Select the option you want to change with the cursor keys в†‘ or в†“ . в–є Press the ESC key to exit the selected menu. в–є For future reference, make a note of the changes you have made (for example, in this manual). в–є To save the current menu settings and exit the BIOS Setup Utility, select Exit Saving Changes and Yes. The notebook is rebooted and the new settings come into effect. в–є To discard the changes, select Exit Discarding Changes and Yes. Setup Utility is terminated and the notebook is rebooted. choose Load Setup Defaults and Yes. в–є To discard the changes you have made, select Discard Changes and Yes. The settings in place when BIOS Setup Utility was called remain effective. You can now make additional settings in the BIOS Setup Utility. в–є If you want to exitBIOS Setup Utilitywith these settings, select Exit Saving Changes and Yes. в–є To save the changes, select Save Changes and Yes. The changes are saved. You can now make additional settings in the BIOS Setup Utility. в–є If you want to exit BIOS Setup Utility with these settings, choose Exit Saving Changes and Yes. в–є To save the changes and switch off your device, select Save Changes and Power Off and Yes. The changes are saved. Your device is shut down. make a note of any error messages displayed. в–є Please contact the Hotline/Service Desk. located on a sticker on the underside of the notebook. Notes of any messages that appear on the screen and information on acoustic signals. Any changes you have made to the BIOS Setup settings since receiving the notebook. Your system configuration and all peripheral devices connected to your system. compared to a desktop PC if you are running processor-intensive gaming software, e.g. versions can be downloaded from: "http://support.ts.fujitsu.com/Download/Index.asp"
plate on the back or underside of the casing. do this, please have ready the ID number and serial number of your system. CD/DVD" to reinstall the operating system. The instructions are provided on the case of the Recovery CD. drive, or CD / DVD disk before you start. в–є Switch the notebook on. When this message appears, press the function key F12 . Insert the "Windows Recovery CD" into the optical drive. Select CD-ROM and press the Enter key. components will not be correctly supported until this has been done. Insert the "Drivers & Utilities" CD/DVD into the optical drive. The CD starts automatically. Click on the Desk Update button. Select Automatic driver installation (Express) and click on Start installation. Restart your notebook when the driver installation is completed. Time and date are incorrect. date and time in the main menu. External monitor or television set connected. в–є Press a key or touch the touchpad. в–є Increase the brightness of the screen. Brightness is set to dark. cable is not connected properly. в–є Switch the external monitor on. в–є Press any key to continue. в–є Adjust the brightness of the monitor. monitor (if it is plugged in with a connector). switch over to the notebookвЂ™s LCD screen. The battery is not installed correctly. в–є Insert a charged battery. The power adapter is not connected correctly. connected correctly to the notebook. Notebook is in energy saving mode. в–є Leave energy saving mode. The printer is not switched on. The printer is not connected correctly. installed, or it is the wrong printer driver. documentation supplied with the printer). loaded (refer to the printer documentation). The wireless component is disabled. switched on via the software. component can be found in the help files. A beep sounds every few seconds. The battery is almost flat. by the operating system or programmes are described in the relevant documentation. contact the place of purchase or our customer service centre. buffer battery in the notebook is flat. в–є In the BIOS Setup, select the Exit menu. в–є Select the entry Load Setup Defaults. в–є Select OK and press the Enter key. module has been inserted correctly. resulted at the address xxxx. submenu) and select the correct settings. The settings of the hard disk drive are incorrect. в–є Make sure that no key is pressed. disk has been set correctly. installed on the corresponding drive. settings. Check the settings in the BIOS Setup. sheet on your device or on the Internet at "http://www.fujitsu.com/fts/support/". An additional mains adapter or power cable can be ordered at any time. essential requirements and other relevant provisions of Directive 1999/5/EC. terminal equipment and mutual recognition of conformity. corresponding supervisory authority as to whether the use of this product is permitted in your country. not approved by the Federal Communications Commission (FCC) of the USA. recommends not to bring this device into the US trading area. could void this userвЂ™s authority to operate the equipment. вЂў Reorient or relocate the receiving antenna. вЂў Increase the separation between the equipment and receiver. вЂў Connect the equipment into an outlet that is on a different circuit than the receiver. вЂў Consult the dealer or an experienced radio/TV technician for help. 1. The telephone number to which the notebook is connected. 2. The Ringer Equivalence Number (REN) for this equipment. which is FCC Part 68 compliant. 4. The FCC Registration Number. between the modem and the telephone network with a minimum of 26AWG. will also be advised of your right to file a complaint with the FCC. This fax modem also complies with fax branding requirements per FCC Part 68.
network until the problem is corrected and you are sure that the equipment is not malfunctioning. commission, public service commission or corporation commission for more information. вЂў Remain on the line and briefly explain to the dispatcher the reason for the call. вЂў Perform such activities in off-peak hours, such as early morning or late evening. All public or semi-public coin-operated or credit card telephones. person with impaired hearing might be isolated in an emergency. such as fire, police or medical assistance personnel. Hospital rooms, residential health care facilities, convalescent homes and prisons. Hotel, motel or apartment lobbies. Stores where telephones are used by patrons to order merchandise. to reserve lodging or rental cars. will be provided to hearing impaired customers on request. sur le matГ©rial brouilleur du Canada. certification standards does not prevent service degradation in some situations. user to disconnect the equipment from the telephone line. Ringer Equivalence Numbers of all the devices does not exceed five. inspection authority or electrician. This may be particularly important in rural areas. applicables au matГ©riel terminal. Cette conformitГ© est confirmГ©e par le numГ©ro dвЂ™enregistrement. dвЂ™Industrie Canada ont Г©tГ© respectГ©es. Il nвЂ™implique pas quвЂ™Industrie Canada a approuvГ© le matГ©riel. peut dans certains cas empГЄcher la dГ©gradation du service. tГ©lГ©communications Г exiger que lвЂ™utilisateur dГ©connecte lвЂ™Г©quipement de la ligne tГ©lГ©phonique. dвЂ™Г©quivalence de la sonnerie de tous les dispositifs nвЂ™excГЁde pas 5.
ou un Г©lectricien. Ceci peut ГЄtre particuliГЁrement important en rГ©gions rurales. This unit requires an AC adapter to operate. Only use a UL Listed Class 2 adapter. To reduce the risk of fire, use only 26AWG or larger telecommunications line cord. same type and rating fuse. with the same or equivalent type recommended by the manufacturer. Dispose of used batteries according to the manufacturerвЂ™s instructions. cause undesired operation of this device. the instructions, it may cause harmful interference to radio communications. However, there is no guarantee that interference will not occur in a particular installation. 1. Reorient or relocate the receiving antenna. 2. Increase the distance between the equipment and the receiver. 3. Connect the equipment to an outlet on a circuit different from the one the receiver is connected to. 4. Consult the dealer or an experienced radio/TV technician for help. Please note the following regulatory information related to the optional radio device. standards, the distance between the antennas and the user should not be less than 20 cm (8 inches). they operate within the guidelines found in radio frequency safety standards and recommendations. perceived or identified as harmful. authorization to use these devices prior to operating the equipment. to correct any interference caused by such unauthorized modification, substitution or attachment. or violation of government regulations arising from failure to comply with these guidelines. that may cause undesirable operation. invalidate the userвЂ™s right to operate this equipment.